Turmeric | Become Healthy or Extinct! Turmeric strengthens and improves the digestive system by helping to maintain intestinal flora, improving the body’s ability to digest fats thereby reducing intestinal gas and bloating as well as improving the elimination of wastes and toxins. It treats dyspepsia, suppresses inflammation in stomach and prevents and treats ulcerations of all kinds including gastritis, colitis and irritable bowel syndrome. Turmeric supports healthy liver function and detox by increasing the liver’s bile flow thereby making it a liver cleanser that rejuvenates the liver cells and recharges their capability to break down toxins. It also helps to prevent alcohol and other toxins from being converted into compounds that may be harmful to the liver. Curcumin, the pigment that gives turmeric its yellow-orange color, is Turmeric’s anti-inflammatory ingredient, that helps reduce irritation to tissues characterized by pain, redness, swelling and heat. Studies show that Curcumin is also anti-carcinogenic because it inhibits tumor growth, angiogenesis and metastasis. It helps the body destroy mutated cancer cells, inhibits the synthesis of a protein thought to be instrumental in tumor formation and prevents the development of additional blood supply necessary for cancer cell growth. Turmeric contains Curcuminoids that fight cancer, arthritis, joint stiffness and Alzheimer’s. Curcuminoids are potent phytonutrients (plant-based nutrients) that contain powerful antioxidant properties, which neutralize the damaging effects of free radicals in the body. Turmeric has also been found to help in the treatment of cystic fibrosis, diabetes, crohn’s disease, eczema, psoriasis, rheumatoid arthritis, cataracts, gallstones, infections, jaundice, muscle regeneration and inflammatory bowel disease. Turmeric’s volatile oils also have external anti-bacterial action, which is why they help prevent bacterial wound infections and accelerate wound healing to a great extent. Turmeric is also known as a respiratory herb because it reduces cough and sinus congestion and it relieves sore throat and asthma as well. Drink water when you wake up in the morning. Then do a mouth gargle of one cup of warm salt-water. Never use table salt. Use fat sea salt (Sodium Chloride). Do not eat or drink anything for 30-45mins after this. Next, have your breakfast. After breakfast mix ¼ teaspoon of tumeric in half glass warm water. Sip it slowly over 5mins. You can add a little honey if you cannot stomach the original taste. 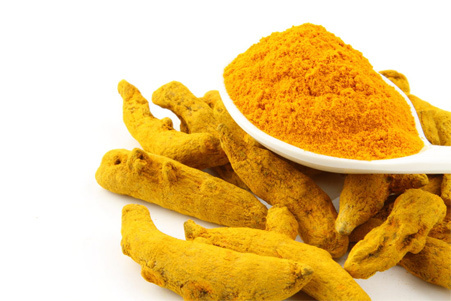 The coating of the tumeric should remain on the throat for as long as possible, so do not eat or drink anything for the next ½ hour at least. You can repeat the above process in the evening at teatime too. At night, before you go to bed, mix ¼ teaspoon of turmeric in half glass warm drinking water and sip it slowly over 5mins. Do not eat or drink anything after this. Do this for 3 days at least and from the benefits, decide if you want to continue it for another couple of days. Sounds good. What about chilsren do we follow the same process? Yes, you can follow the same for children of 10 years. Below that reduce the dosage by 1/3rd.